A man killed his mother and sister and wounded a third person on a street in a Paris suburb before being killed by police. 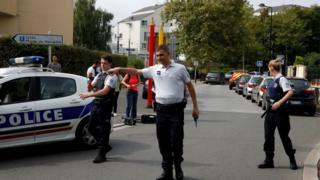 French Interior Minister Gérard Collomb said the incident was not currently being treated as a terror attack. The Islamic State group claimed it was behind the attack but offered no proof. Some reports say the man threatened to kill police and shouted "Allahu Akbar" ("God is greatest" in Arabic) before he was shot. The man ran into a house after attacking his victims before coming out with a knife in his hand, at which point he was shot by police. Speaking in the south-western suburb of Trappes where the incident took place, Mr Collomb said the attacker appeared to have had "significant psychiatric problems". He said the man had been known to police for expressing extremist views, but was "unstable" and "not someone who could respond to instructions from a terrorist group". France has been on constant alert for jihadist terrorist attacks since the Paris attacks of 2015. Trappes, close to Versailles, is known for gang violence and poverty. It also has Islamists among its large Muslim population, with 50 local people suspected of having left France to fight for the Islamic State group in Syria and Iraq, according to security sources quoted by AFP.